Gregory Popovich’s Comedy Pet Theater Las Vegas is a widely creative take on life with the main performers being animals. This 90-minute family-friendly has brought an innovative mix of humor with circus-style entertainment to Las Vegas. 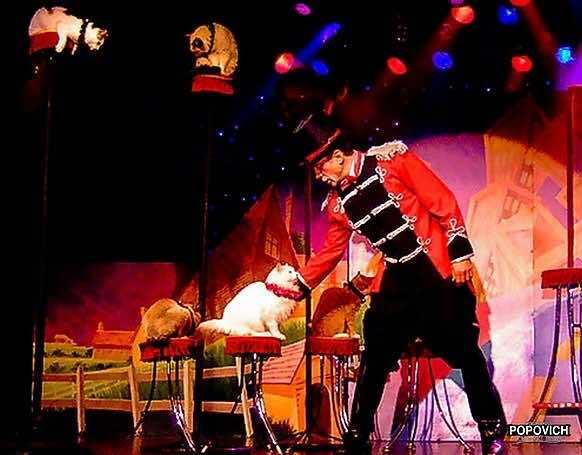 After performing years at the Circus Circus Hotel and Casino Popovich brings his own circus atmosphere to the V Theater that features over 30 animals performing a variety of tricks and skits. 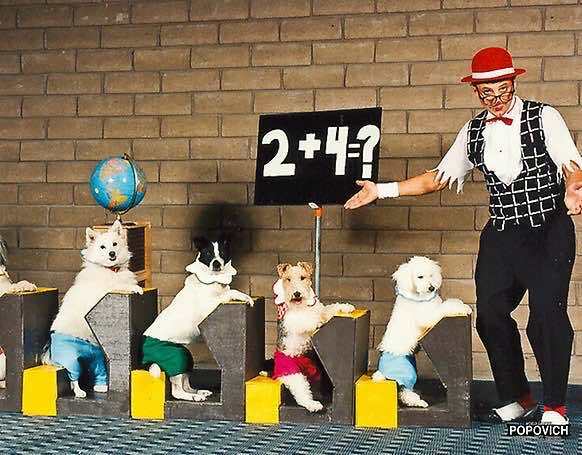 Gregory Popovich’s Comedy Pet Theater is packed with fun little skits that include adorable animals like dogs and cats. The said are not just ordinary pets though. These pets have a variety of skills that are put on display during the event and they talk with an animated voice. One segment might have the animals boarding a train and riding around the stage as smoke pours from engine. You can only image the laughter from the audience when one dog passenger complains to the dog conductor about the seating. 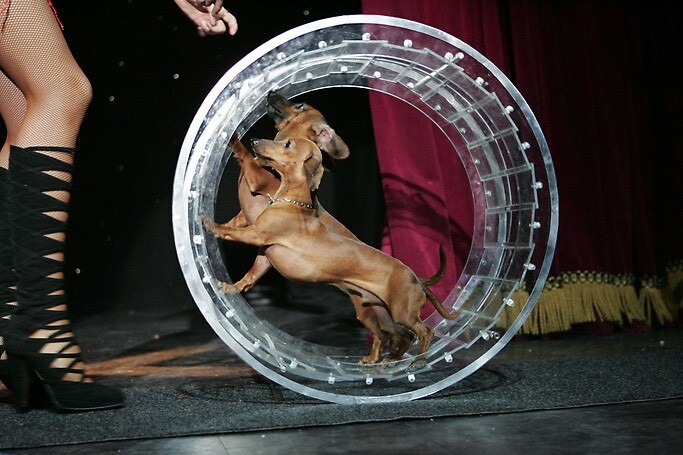 Other portions of the show may have a dog riding a skateboard and singing a song or climbing a ladder and holding a tarp while a cat jumps out a miniature window. The animal’s sarcastic commentary is injected perfectly into the performance and is quite humorous. Popovich leans on his Russian circus roots in the show with several traditional circus-style acts that include acrobatics, dancing, gymnastics and juggling. Throughout the event Popovich performs effortlessly as he catches plates that are thrown at him and balances on a beam while juggling numerous items. Popovich allows his family to get in on the entertainment with his daughter Anastasie whirling a baton while leading a group of small dogs in a dance routine. His wife Izolda astonishes the crowds with her athletic ability and her choreographed event which includes fourteen cats jumping through hoops. The V Theater located at the Miracle Mile Shops within the Planet Hollywood Hotel and Casino is a good venue for this entertaining family-friendly event. The stage props are easily choreographed on the small stage and the use of multimedia effects enhances the experience. This show has a more of a traditional European circus-style as opposed to a present day Cirque du Soleil performance. Gregory Popovich’s Comedy Pet Theater Las Vegas has all right stuff to entertain your family for the afternoon. 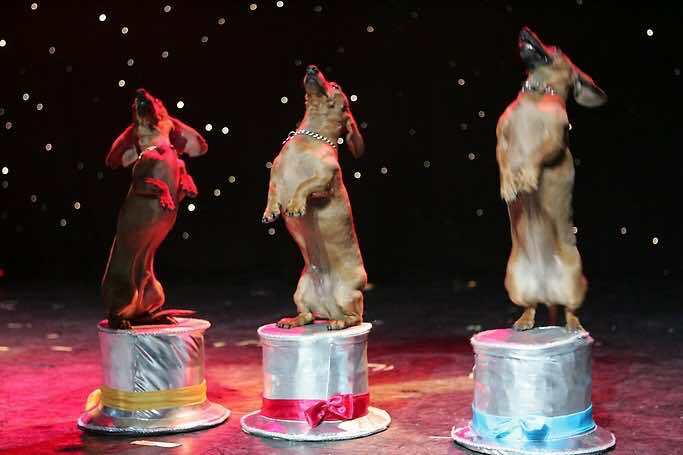 Many happy memories will be created when you attend this fantastic upbeat and high energy show that features humans as well as adorable animals. Gregory Popovich was born in Russia and is a fifth generation circus performer. While growing up Popovich attended the Moscow Circus School and would eventually perform for the Moscow Circus as well as Ringling Brothers and Barnum and Bailey Circus. After performing worldwide, Popovich landed in Las Vegas at the Circus Circus Hotel and Casino in 2001 where he performed for many years. Popovich is an acclaimed animal enthusiast and is especially fond of using rescue animals in his performances. Popovich is an accomplished author and has been recognized by many foundations for his work with shelter animals. Popovich has been featured on Animal Planet, America’s Got Talent, The Late Show with David Letterman and The Tonight Show with Jay Leno. The show is performing at the V Theater within the Miracle Mile Shops at Planet Hollywood Hotel and Casino. The venue has good sight views and comfortable seating. The show is open to all ages and is family-friendly.The show is playing Tuesday through Saturday at 4:00 P.M. Comedy Pet Tickets are on sale now and range from general admission first come first serve seating to a reserved VIP seat.